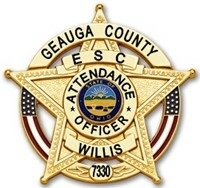 George "Pat" Willis is the Attendance Officer for Geauga County. Working for the Geauga County Educational Service Center, Deputy Willis works with the Geauga Sheriff's Department and Juvenile Court to make sure that students are attending school. Ohio law compels youth of compulsory school age to attend school. Under HB410, enacted July 2017, children are in violation of Compulsory School Attendance Laws of the State of Ohio when as a Habitual Truant the child is absent without legitimate excuse from the public school for thirty (30) or more consecutive hours, forty-two (42) or more hours in a school month, or seventy-two (72) or more hours in a school year without legitimate excuse. The new legislation requires the Truant Officer to send a letter to the parent(s) or legal guardian explaining the compulsory school attendance laws when a school aged youth is absent from school with or without legitimate excuse for thirty-eight (38) or more hours in one school month and sixty-five (65) or more hours in one school year. A school aged youth can be charged as an Unruly Child, ORC 2151.022, due impart to his/her non-attendance at school. As the parent, you are subject to certain penalties under Ohio law unless your child is in regular school attendance. Charges will be filed against parent(s) or guardian for Contributing to Unruliness or Delinquency of a Child, ORC 2919.24. My goal is to have children attend school regularly without causing a financial burden to parents by avoiding any court remediation on the parent and/or the child.